Light dimmers are circuits which vary the amount of power going to a light source. The common one associated with the word “light dimmer” is a circuit which dims incandescent bulbs running of a mains (110, 230VAC) supply. The most basic way to dim a light is to put a variable resistor in series with the light. This is very simple but has the following disadvantages: 1. It is not very efficient, and the resistor dissipates the remaining energy that is not used by the light, causing heating issues for any moderate dimmer circuit. 2. The colour “temperature” of a tungsten light gets worse with increased dimming, as the voltage across the light drops. 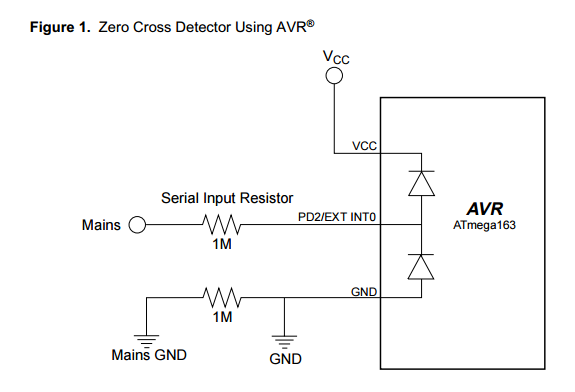 A very simple two-component mains zero-cross detection circuit. Image from http://www.atmel.com/. More info on this circuit can be found here. The Cirrus Logic CS1610 family of ICs are designed to be built into the base of an LED lamp, and provide LED dimming when powered from a main supply which is being altered by a circuit which is dimming on either the leading or trailing-edge.